If it weren’t for LeBron's Game 2 resurgence and San Antonio’s historic Game 3 performance, all anyone would still be talking about is Game 1’s "LeBroning" episode. KABB out of San Antonio piled on with some LeBroning of their own. 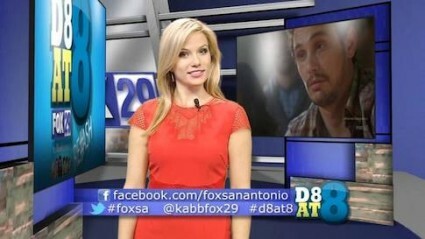 That young reporter carrying KABB’s sports guy is Jessica Headley. She's the station’s traffic correspondent. Jessica does more than just pose in front of a green screen during rush hour. She’s the station’s "Jill of All Trades," a role she’s prepared her entire life for. And for that, she’s in this week’s local reporter spotlight. KABB sends her out toa boxing gym in preparation for her sit-down with Canelo Alvarez. Then even have Jessica preview upcoming movies and cover local bands. They assign Jessica to cover virtually everything. I'm sure the locals don't mind she hosts her movie preview shows in full costume. The Free Beacon could use a movie reviewer of Jessica's talents; it'd be nice to have someone on staff who's actually correct in their opinions for once. She doesn't need an excuse to dress up. Weather, sports, traffic, and entertainment just skim the top of her skills. She’s also interviewed Senator Ted Cruz. She worked on the "No On Proposition 29" in California, which fought against an excise tax on cigarettes and has penned Huff Post op-eds where she suggested ways for Republicans to reach young voters. Finally, a Huff Post blog worth reading. Jessica was an appointee by President Bush to work for the USA Freedom Corps. While in D.C., she dabbled in the Miss D.C. pageant and learned to properly throw a baseball from the GLP. She earned her spot in the program by founding a nonprofit that helped pass legislation in her home state of Alabama to improve its educational system. While growing up in Alabama, she also competed in the Miss Alabama pageant. It makes sense that Jessica has been such a valued asset and has been rocketing up the ranks.